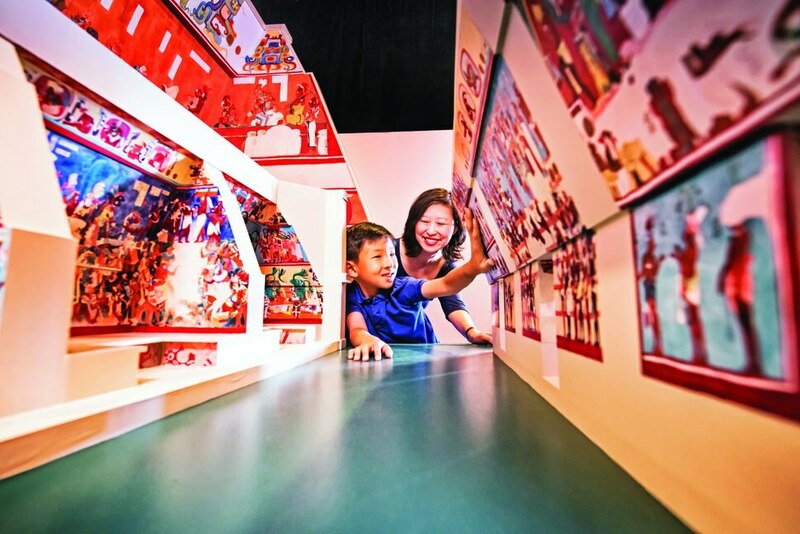 (Photo courtesy of the Natural History Museum of Utah) Visitors to the exhibit "Maya: Hidden Worlds Revealed" can discover why the Maya charted the 365-day solar cycle and predicted solar and lunar eclipses. With more than 250 artifacts, a new exhibit at the Natural History Museum of Utah shows the culture of the Maya through immersive environments and activities. The Classic Maya civilization, A.D. 250 to 900, has drawn popular and scientific interest since the modern discovery of ruined cities in the jungles of Central America in 1839, according to the Science Museum of Minnesota, one of the creators of the traveling exhibit. Maya: Hidden Worlds Revealed has nine sections, exploring the art, science, beliefs and daily life of the Maya, the story of their descendants today and what researchers are still learning about the culture. (Photo courtesy of the Natural History Museum of Utah) Maya artists painted walls of three small rooms in Bonampak with scenes of war and celebration, shown in replica in the exhibit "Maya: Hidden Worlds Revealed." Visitors can learn how to read Maya hieroglyphs carved into stone stelae; why the Maya charted the 365-day solar cycle; and how they planned cities and created goods. Guests can also see images made with an infrared camera that reveal details of murals that are invisible to the naked eye. The exhibit is presented in English and Spanish and will be on display from Saturday until May 27. To mark Saturday’s opening, the Natural History Museum of Utah will hold ¡Celebración! A Tapestry of Culture, from 10 a.m. to 5 p.m. It will highlight the living traditions of the indigenous peoples of Central America and Mexico, with lectures, performances, demonstrations and activities planned throughout the day. Various partners will sell textiles, foods and artwork. The museum is at the Rio Tinto Center, 301 Wakara Way, Salt Lake City. More information is available at nhmu.utah.edu/museum/exhibits/maya, including museum hours and ticket prices.